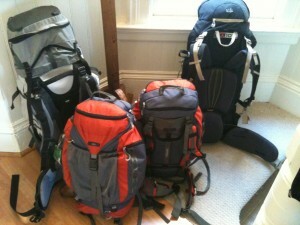 As we drove from the station yesterday our landlord congratulated us on choosing Prenzlauer Berg as a place to stay. Having thoroughly established our cool bona fides with the locals we’ve settled right in. All we lack is a piercing, a plaited beard and army-surplus clothing. According to Wikipedia, the area, after the Wall coming down, became a “centre for more bohemian Berlin youth, while more recently it has experienced gentrification.” The area is full of little cafes and restaurants and strange shops either selling unusual second-hand items or cutting edge cool, designer items. Bikes abound, many of which have carriers for kids in what is probably evidence of the aforementioned gentrification. Anyhow, we woke up this morning in our substitute apartment and after a long morning on schoolwork set out for Checkpoint Charlie. We’d wisely put on our thermals and additional layers but it has to be said that it was brass-monkey freezing. Officially, the temperature was about -5, but bung in some wind-chill and it was just c-c-c-cold. We’ve come over all Russian soldier though, and nothing deters us or causes us to put down our ear flaps. For the kids this is particularly true as, after getting fed up with them not hearing what was said to them, I have removed the hoods from their ski-jackets. Their ears are now permanently exposed. Strangely, stories of the stoicism of Russian soldiers have not stilled the complaints yet, but it’s early days. Cold with a bit of Wall. 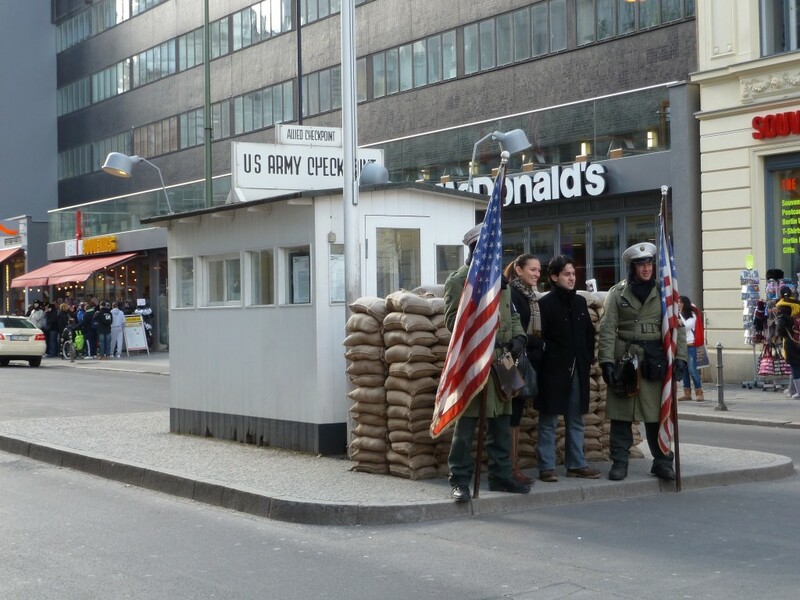 Checkpoint Charlie, which I went through when it was an actual Checkpoint, is a tourist attraction of the worst sort. There’s a recreation of the checkpoint building, with a couple of bored students dressed up as US and East-German soldiers standing guard for photographs. That made the somewhat shambolic Checkpoint Charlie Museum a refreshing surprise. It’s not the slick tourist trap you expect given the exterior, but rather memorabilia from people who helped others escape and a heartfelt chorus from the founder about anyone standing up to oppression anywhere in the world. 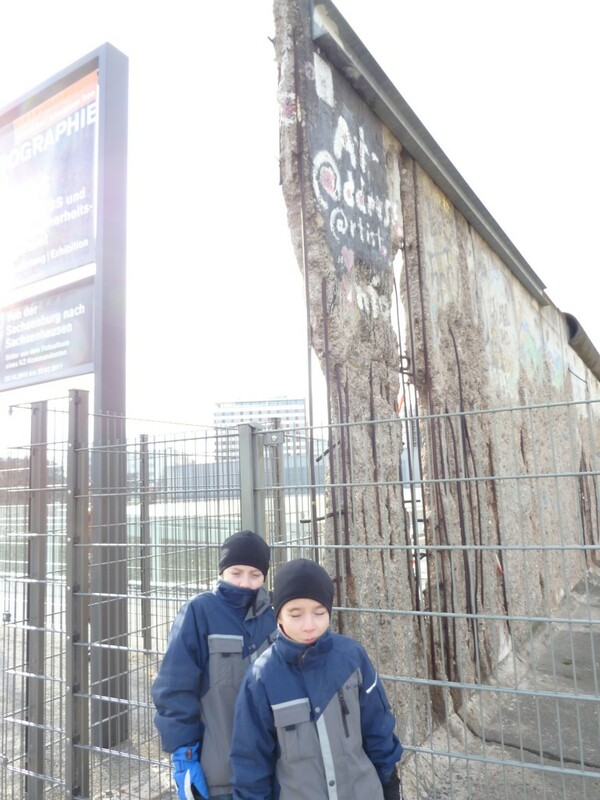 The boys were, predictably enough, very taken with the various methods used to smuggle people out of East Berlin. Declan was deeply saddened by the tales of oppression and people who failed to escape. So much so that he eventually had to give up and retreat to the shop with a brooding look on his face. From the Museum we walked round to Brandenburg Gate. It’s a good walk because you walk past the line where the various Government building were placed in WW2 and where Hitler’s bunker stood. I remember seeing the remnants of the bunker twenty-something years ago; now there’s a block of flats where it lay. The boys were disappointed, but understanding when we related it to the neo-Nazi demonstration we’d caught sight of in Dresden yesterday. Brandenburg Gate is a great symbol of the new Germany when you relate it to the past. In the Museum, we’d just seen images of it swathed in curtains so that the East Germans would not see JFK in 1963. To see the Gate freestanding and part of an undivided City is wonderful. I would love to understand more about how the new Berlin works. How you go about putting a divided City back together. How you join the bits to make it function as one again. I hope we’ll find more on that as we go. Returning to Prenzlauer Berg we moved to the apartment we’d actually booked (much nicer) and then walked round to the weekly flea-market in the Wall Park. This is an enormous market selling everything from clothes to bike parts, from toys to books, and up to literally kitchen sinks. Just wandering about it is a fascinating experience. The Park itself was made from space freed up when the Wall came down. There’s a lot of symbolism in making the ultimate dead-space to a living place full of activity and, it has to be said, capitalism in action. Hi Guys, it looks like you are having a ball. Berlin brings back memories for me. I was there the year the wall came down. The first visit to East Germany in April 1990 required a visa, the second visit in July the wall was gone and we just walked/drove through what was a checkpoint. I’ll keep reading your travel notes, it makes me dream even more ! I was there a month or two after the wall came down too. And it wasn’t down! It is funny that if you rewd about it now it sounds as if it was instant, but I remember having to chain some exorbitant number of Deutschmarks into east german marks just as if it was still communist.